NEW YORK (CNNMoney) -- The long, sordid legal saga between Facebook and the much-maligned Winklevoss twins may finally be over. A federal appeals judge on Monday affirmed a lower court ruling which said that the twins cannot unwind a settlement they signed in 2008 over the creation of Facebook. 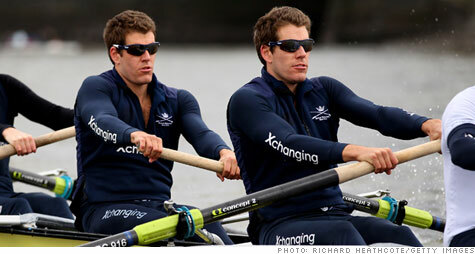 Cameron and Tyler Winklevoss (a.k.a. "the Winklevii") and a third Harvard classmate, Divya Narendra, filed suit in 2004 against Facebook and CEO Mark Zuckerberg. The trio alleged that Zuckerberg had stolen the idea for Facebook from them -- an idea dramatized last year in the Oscar-nominated movie The Social Network. The back-and-forth drama played out publicly for years until, in 2008, the Winklevosses and Narendra signed a settlement valued at $65 million, part in cash and part in Facebook stock. But the trio later tried to pull out of the deal, alleging that Facebook had misrepresented the value of its stock. A judge ruled against them and forced the settlement to go through, but the Winklevosses and Narendra took the case to court. The Monday ruling from Judge Alex Kozinski, chief judge of the U.S. Court of Appeals for the Ninth Circuit in San Francisco, appears to put the kibosh on the case at last. The judge clearly intends his verdict to be the headshot that kills off this zombie litigation. 0:00 /2:30What former CEO friended Zuckerberg? Kozinski acknowledged the Winklevosses' claim that Facebook led them to believe their shares were worth $35.90 at a time when the company actually believed them to be worth less. But with the help of a "team of lawyers and a financial advisor," the Winklevosses made a legally binding deal, and now they have to stick to it, Kozinski said. "The Winklevosses are not the first parties bested by a competitor who then seek to gain through litigation what they were unable to achieve in the marketplace," he wrote. Besides, Facebook's recent stratospheric valuations have made the whole fight somewhat moot. As Kozinski dryly put it: "They made a deal that appears quite favorable in light of recent market activity."